Get ready for a taut mystery-shocker that will keep you at your wit's end and at the edge of your seat. Popular high school senior Virginia Wainwright (Melissa Sue Anderson) survives a freak accident, but suffers from memory loss and traumatic blackouts. As she attempts to resume a normal life, something terrible is happening — her friends are ruthlessly murdered one-by-one. Will she be the next victim or is she the killer? The terrifying truth is finally uncovered at Virginia's 18th birthday party...and you're invited. My wife used to drive me nuts always watching Little House on the Prairie before she passed away... so Melissa Sue Anderson is very familiar to me from that.I found this movie to be very good... I really enjoyed it. I have to say... I got a kick out of that bridge game they played towards the beginning of the movie. I think Melissa Sue Anderson did a very good job on this movie. I grew up with '80s horror... and definitely watched quite a bit of it. I would rank this one high on the list of the many movies I remember watching at the time. I found some... if not most of the killings to be really imaginative. The DVD release could have definitely been better. Especially that cover art! Why they didn't use the movie poster for the cover art I will never understand. And there is actual no extras what so ever on this disc concerning this movie. Not even the theatrical trailer. I would have loved to seen a few extras here. Some deleted scenes... commentary... pretty much anything that was actually about the movie. But no such luck. When Dawn feels that nobody wants to spend time with her, she makes a wish in front of a Vengeance demon (posing as school counselor) that everyone would stay with her. During Buffy's birthday party, Dawn's penchant for shoplifting is discovered while the gang tries to figure out why nobody is able to leave the house. This is the last "Buffy's Birthday" episode of the series. And a very good one at that. I always enjoyed every minute of this episode the several times I have watched it. 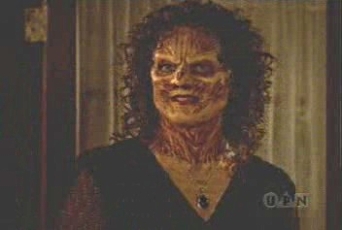 There is something that seems familiar about the woman that plays the Vengeance Demon... other then here on Buffy. I do know she was on Buffy several times. THERE ARE NO RULES IN "THE GAME." And that will make life very difficult for Nicholas Van Orton, a successful businessman who is always in control. Van Orton lives a well-ordered life – until an unexpected birthday gift from his brother destroys it all. Like it or not, Nicholas has been enrolled in a game – "a profound life experience" that begins quietly but soon erupts in a rush of devastating events. Van Orton has to win this deadly game or lose control of everything in his life. I haven't seen this movie since I bought it several years ago. It's definitely one I enjoyed. A movie that keeps you guessing. Though I did find that it does drag a little here and there. I really liked Michael Douglas in this one... but I didn't care much for Sean Penn. That is not a surprise though... as I don't remember ever enjoying him in anything that I saw him in. There is just something about him I don't care for. If you haven't seen this one it is definitely worth checking out. Thinking everyone forgot his birthday, Willis drops several unsubtle hints that seems to go unnoticed. But he gets the surprise of his life when his biggest wish comes true. After the sad news of the passing of Gary Coleman today I felt the need to watch something with him in it. 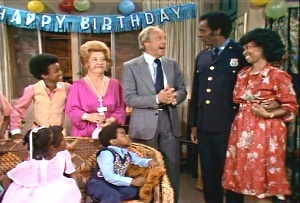 So I found a birthday episode of Diff'rent Strokes. It is a pretty fun episode... though not one of the best of the series. There was a few laughs... but the concern shown about going to Harlem wasn't very believable. It seemed strange coming from them what with how they always seemed to have the right answers from the start in most all episodes. Ah, the part of that episode where the guy comes into the party via the window and the reactions that follow raised a laugh out of me, I have to admit. Yeah... that part gave me a laugh too. That guy looked familiar too but I couldn't place him. The guy was just credited as Scorpio. Yeah Britt... that tends to happen to me sometimes. It's her 16th birthday, and Sabrina (MELISSA JOAN HART) is feeling a little strange. She just transferred to a new school, moved in with her two otherworldly aunts, and nothing is quite what it seems. Things can only get more complicated when Sabrina learns that she's a real witch. Now, she's got to make friends, memorize spells, and find a way to get a date for the school dance. It'll take a little hocus-pocus and a whole lot of adventure before Sabrina learns to control her powers and find true love. I felt like something a little more light hearted next. So thought I would watch this TV Movie that originally aired on Showtime... and started the series of the same name. The first thing you notice when watching this movie is that it has different actresses playing the aunts then what the series has. After watching the series for years this was a little on the weird side since there is such differences. The boy that Sabrina likes in this episode is played by a very young Ryan Reynolds. I have become a fan of his since I have seen him in a handful of horror movies. Over-all I enjoyed the movie... was a lot of fun... and it kinda put me in the mood for the series again. No complaints quality wise... looks as good as it did when it first aired. But I do have to complain when it comes to extras... because there was none what so ever! Jimmy... you can just replace the 2 other reviews of this movie with this one. Much more detailed. On her 16th birthday, Sabrina Spellman discovers that she's been given the gift of magic when her Aunt Hilda and Aunt Zelda inform her that she is a witch. Well... I did say the movie put me in the mood for the series didn't I? This is more like it. These are the characters I think of when I think of Sabrina: The Teenage Witch. I enjoyed this pilot episode even more then the movie.It just felt like a better start for the series. I mean the movie was good for what it was. But this is much better for a TV Series in my opinion. In 1970, three children were born during the height of a total eclipse of Saturn, the planet governing emotion. Ten years later these seemingly innocent children have become heartless killers able to move around under the radar of suspicion because of their youthful facades. What happens when a teenage girl and her younger brother stumble upon the horrible truth? Yes... I just watched this one 5 short months go... but how couldn't I watch it for my birthday? I remember really enjoying this one back in my early teens when it first came out. I can't say it is quite as good as I remember it being. But I definitely enjoyed every minute of it. Of course I do have a soft spot for '80s horror... after all they are the movies I grew up watching. Sure, evil children has been done to death. Some probably done better then this one. And more times then not it seems to have to do with an eclipse when the children was born. But that don't take away from the fact that this one is good. It has some creative kills (gotta love the arrow through the peephole!) and a good story. I am so glad I finally found this movie again... and the fact that it cost me less then $4.00 is icing on the Bloody Birthday cake. While I really can't complain... I do wish this one had more extras on the disc. Jo wants to surprise Mrs. Garrett with a birthday gift to rival Blair's. But the real surprise occurs when Mrs. Garrett goes to exchange it and is arrested for shoplifting. This is a sitcom I always liked. It is one that knew how to get it's laughs but at the same time tackle the serious issues. And they did so without taking any type of cheap shot at the issue they were taking on. It was always done fun but respectfully. While a good episode... this one isn't the best episode I ever seen... but it has a few chuckles for you. Big-screen stars Steve Guttenberg (Three Men And A Little Lady) and Kirsten Dunst (Drop Dead Gorgeous) encounter a host of haunts in this delightfully spooky mystery! Buzzy Crocker (Guttenberg) is a hard-luck photojournalist whose unexpected encounter with an old woman leads him to investigate an unexplained, decades-old disappearance. It seems that one Halloween night, many years ago, five partygoers vanished in the elevator of the Hollywood Tower Hotel...and ever since, their ghosts have remained trapped inside the dilapidated old building! In an action-filled story that delivers creepy fun for everyone, Buzzy ultimately teams with his niece (Dunst) to solve the mystery while managing to save their lives and capture the biggest story of the year! I know at first thought what does this have to do with birthday? That is what I thought at first till my daughter reminded me how much it does have to do with birthdays. Not only is there a party mix-up that caused the whole thing... but it is also the old lady's birthday when she wants to return to the hotel many years later. This is a fun little spook-tacular from Disney that is made with the entire family in mind. Brittany and I watched this one together today. And we both enjoyed it. Rob finds out about Laura's plans to surprise him for his birthday. This is an excellent episode of a great classic TV Series. I literally laughed out loud several times through-out this episode. 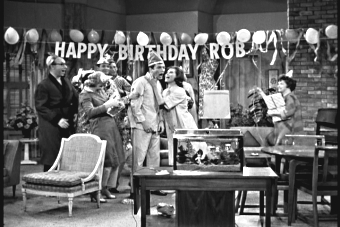 It was hilarious seeing Rob sneaking around figuring out his wife's plans for his birthday... and just as hilarious to see his reaction when he realizes he got surprised by a Surprise Party that he knew was coming. I really loved every minute of it... not only a great birthday episode... but a great episode period.